We are in the process of planning an IPv6 and Cloud workshop. More details will follow. Our next Roundtable meeting is at the Jisc offices in Manchester from 2-5pm on 8th April 2019, the day before the UKNOF meeting in a very nearby venue. You can register for the meeting and see more information about the agenda here. The venue is Jisc, 6th Floor, Churchgate House, 56 Oxford Street, Manchester, M1 6EU. A light lunch buffet will be provided from 1pm. Materials from the event are available here. Once again, our thanks go out to BT for hosting the meeting. This event, focusing on discussion of IPv6 transition strategies, scenarios and tools, was kindly hosted by Imperial College London on 25th September. Operators presented their views and experiences on a wide range of transition mechanisms. Slides from the event are available here. A roundtable meeting took place at Facebook’s offices in London on Wednesday 25th April 2018. We held a partnership event with Cisco and BT on the subject of enterprise networking. For more details and slide decks from the meeting see the event page. The UK IPv6 Council’s 4th Annual Meeting, hosted kindly by BT, attracted over 100 attendees. You can now view slide decks, photos and videos from the meeting, which included speakers from BT, EE, Facebook, Cisco and a variety of other expert sources. Our free IPv6 Security workshop, held at BT Centre, London, drew over 120 attendees. The slide decks and videos from the event are now available here. The meeting included speakers from Cisco, Sky, BT, EE, Imperial College, LinkedIn, Facebook and the Internet Society. Slides, photos and IET.tv videos are available here. 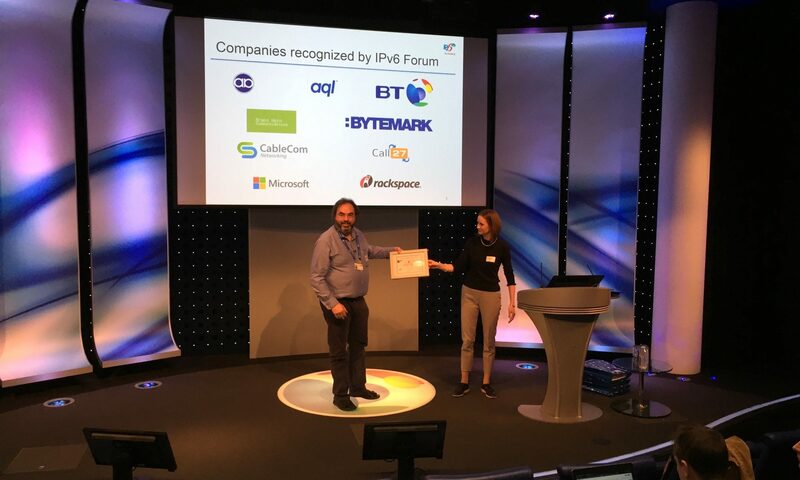 The UK IPv6 Council hosted its fifth round-table event at Microsoft’s offices in London. The agenda included updates about IPv6 deployments by UK ISPs (Sky UK, Virgin Media), Sky’s IPv6 completion, and IPv6 for Smart Cities. Slides are available here. At this event we held presentations and discussion on why IPv6 is important and how it could give your mobile applications a real-world performance boost; technical tips and tricks for using IPv6 with the Apple iOS API’s as well as with C/Java/Python/PHP; IPv6 for environmental sensor networks, through 6LoWPAN technology; and the Microsoft perspective on IPv6 for the XBox One. Slides are available here. The UK IPv6 Council hosted its Spring round-table event in Central London. This was the first event of 2016 and, as always, the agenda which was fairly fluid but evolved into a more topic focused afternoon, including updates about IPv6 deployments by UK ISPs (Sky UK, Virgin Media); the University of Reading IPv6 deployment in their new campus in Malaysia; experience with DNS Behaviour of Dual-stacked Hosts, and other topics. A recording of the Microsoft Xbox presentation can be found here. Slides from the event can be found here. This was the last event of 2015, but with plenty of mince pies to fuel the discussion! Topics covered included DC virtualisation, containers and how IPv6 is involved; the year in review, looking back over 2015 at IPv6 related activities in the UK; and a discussion of the Council’s focus for 2016. Slides from the event can be found here. After almost a year, the UK IPv6 Council invited our members for another day-long event hosted by UCL in Euston Square, London. The agenda included many interesting talks about the current status of IPv6 deployments in the UK, updates by the largest UK ISPs, and this time with more focus on enterprise IPv6 deployment. Slides are available here target=”_blank” rel=”noopener”. Our second roundtable discussion focused on discussion of the UK Government’s support – or lack of support – for IPv6 deployment. The UK IPv6 Council held its first open roundtable discussion in Spring 2015. The focus was be on sharing our own IPv6 deployment experiences and also discussing future activities that the Council could potentially start. The aim was to provide time and space for many discussions, building contacts and sharing knowledge. Our first in-person IPv6 Council meeting drew a good attendance. Slides are available here. Our first online discussion / webinar focused on the business case for IPv6 in different organisations. The agenda included a round-table discussion with the UK IPv6 Council board members with a focus on business/technical drivers for deploying IPv6 in their respective organisations. The recording of this webinar is posted on our LinkedIn Group page.